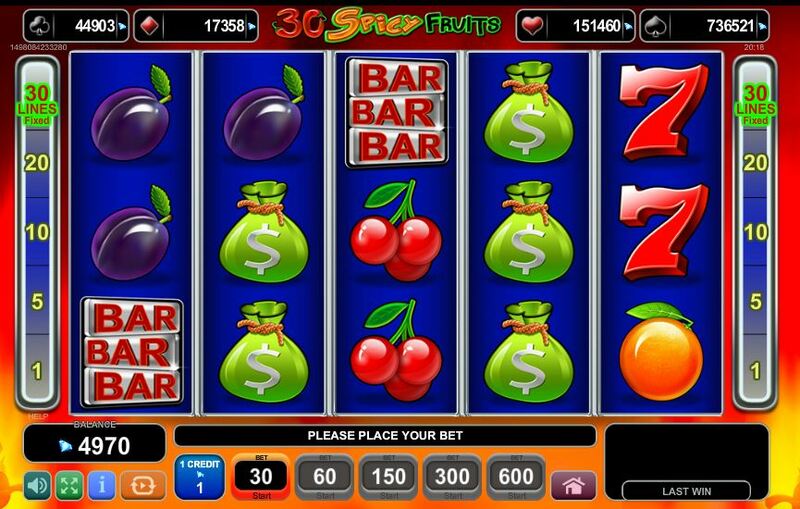 30 Spicy Fruits Slot is a basic looking game with equally plain icons of which only the chilli could be described as 'spicy' as they spin over a plain blue background. Although there are some flames at the sides to imply the heat of this particular pepper. We get the familiar 'whoosh and snick' trademark EGT sounds as the reels spin and stop and the stacked reels may remind you of their Like a Diamond game which shares this type of set-up. So will 30 Spicy Fruits add a bit of flavour to your slot play today? Unlike Like A Diamond slot we do get a feature bonus here on this 30-line game of 5 reels and 3 rows. All symbols appear stacked including the scatter. 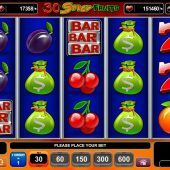 If we start with the Wild it is the Red Chilli and hence the title as a full screen can be had so you get 30 'Spicy Fruit' 5-of-a-kinds, which as they are the top pay of 33.33x bet would land you a very hot 1000x bet! The remaining icons are quite low values though: we pay 30 coins for a spin and the 7's will pay 50, Bells 45, Red Bars 40, Green Bars 30 and Yellow Bars 25. There are no card values but instead there are Oranges, Plums, Cherries and Lemons paying either 15 or 20 coins for the full 5. The $ Cash Bag is the stacked scatter and only appears on reels 2, 3 and 4 and you need 7, 8 or 9 to earn yourself 7, 15 or 30 free games respectively. These cannot be retriggered but are enhanced so there are more high value stacks on the reels.